If you are running ads, guest posts, infographics, social media outreaches, email campaigns, or the like, you need to know what is working. Whether you are running ads, guest posting, publishing infographics, doing social media outreaches, etc..., you need to know what is effective. The problem...most analytics programs only give credit to the last referring campaign. If you have a visitor come to your site through an ad campaign, then through a social campaign, and finally buy something from you; only the social campaign will get credit for the sale. Most analytics programs track page views and visits, not visitors. The information they provide is good information, but it lacks the necessary individual visitor data that is necessary to make good business decisions. 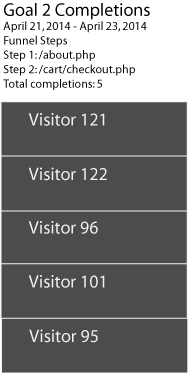 When you can only see how many visitors took a specific action, and not the individual visitor, you cannot tell where one action crosses another. 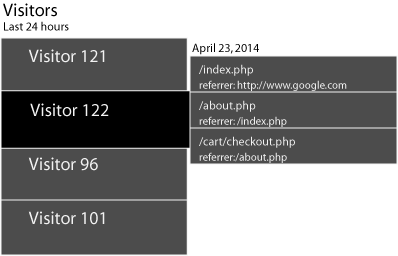 This leaves you wondering exactly what is working on your site. When you can see individual visitors flow through your site, you can understand exactly what is working and what is not. We believe that many of the analytics programs out there are good for aggregate data about site visits. They just lack the specific individual visitor tracking a business needs. This is why we are creating Track Engage. It is not a replacement for your existing analytics software, but an enhancement. We are focused on giving you the ability to track when a visitor first comes to your site and then every interaction after that. We spend a lot of time and money on different marketing campaigns. With Google Analytics, we only know if the campaign is working if a visitor takes the specific actions we want to measure before they interact with another one of our campaigns. We know that this is not the way most buyers come to a decision. Depending on the product, it could take many interactions with our site and campaigns before they buy. We realize we have to track the visitor individually, over a long period of time, and through multiple campaigns. With that realization, we went out looking for a solution and quickly found that it would be a very expensive monthly fee to track visitors. Because we are software developers, we decided to create a solution for ourselves. We believe that every business needs this software. We also believe that it shouldn't cost hundreds of dollars a month. So, we decided to build the product out for every business, including yours. Right now we are hard at work in alpha testing. We are preparing to go into beta testing soon. We will be looking for some business like yours to work with us in beta. To keep up to date with all of the latest developments, insert you email address below. We will add you to the mailing list. We respect your privacy and will never share or sell your information.